Get Visual Business Solutions was engaged by Ding Dong Tea LLC in Pittsburgh PA to conduct a market area analysis for a proposed retail location in the Squirrel Hill neighborhood of Pittsburgh. Ding Dong was considering opening a retail store modeled after four other successful locations in the United States. The market analysis included an assessment of those four successful locations in Ashville NC, Burlington VT, Madison WI, and Portland ME, as well as the proposed Pittsburgh location. At the outset, anecdotal evidence suggested that the Pittsburgh market area likely exhibited higher incomes, population density, and overall population than the other four locations, and thus should provide a very favorable environment for a successful retail store. This also took account of the proposed location close to Carnegie-Mellon University and the University of Pittsburgh, the professions of many people living in the area, and the competitive environment for similar businesses. 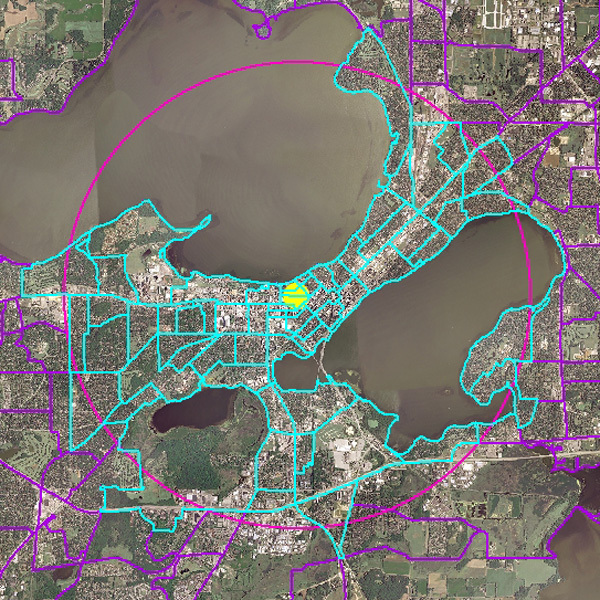 Since sound business decisions are best made with accurate factual information, we set out to quantify the market area populations and their characteristics for all five areas using a location analytics approach. 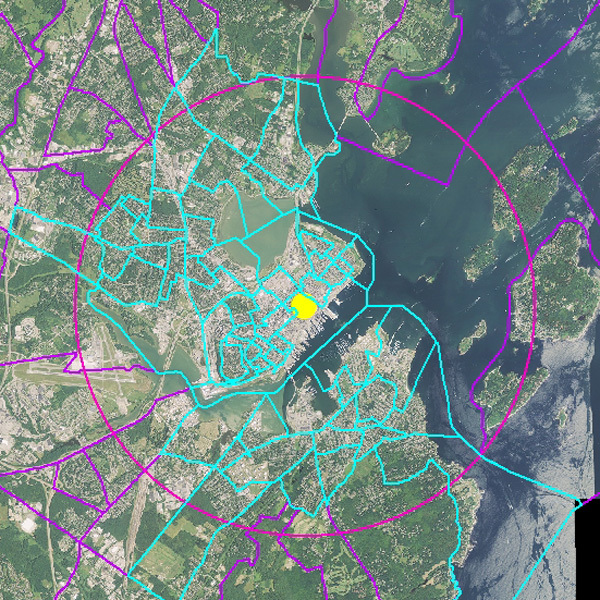 This combined the use of readily-available and very up-to-date maps, aerial photographs (to serve as basemaps), and U.S. Census data using geographic information system (GIS) and relational database management software (DBMS) to integrate and tabulate all the information. We used aerial photos from the National Agricultural Imagery Program (NAIP) for base maps, U.S. Census TIGER block group and tract polygon maps, 2010 population data from Summary File 1, and 2005-2009 population characteristics and income data (5-year estimates) from the American Community Survey. Total population, persons age 16 to 60, median age, percent college graduates, and median household income were tabluated for the area within a 3-mile radius of each retail location in the five market areas. Most of the data were summed from Census block groups as illustrated by the blue areas on the following maps. 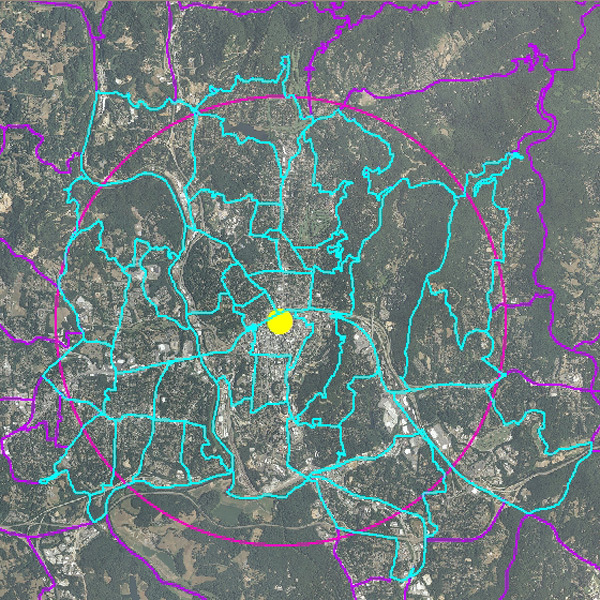 Because of the high population density and urban character of the Pittsburgh location, the same characteristics were tabulated for 1-mile, 2-mile, and 3-mile areas around the proposed location. 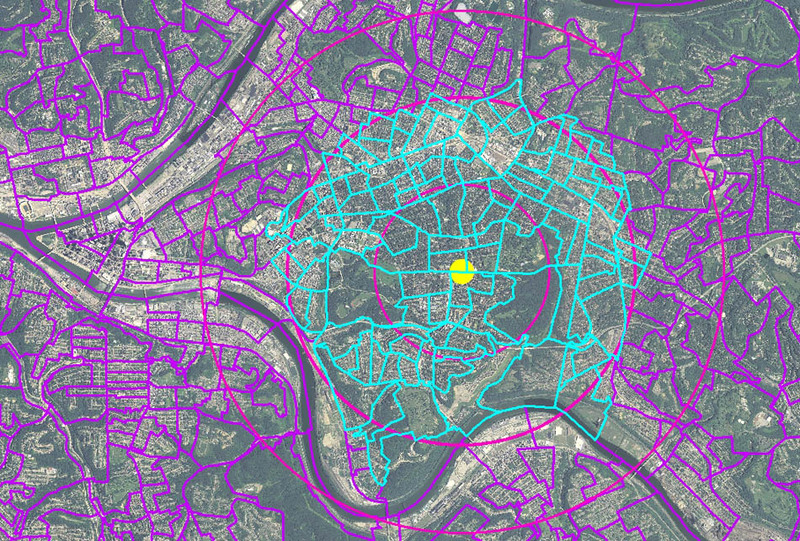 The maps that were used to assemble Census block group polygons (purple areas, with blue areas “selected”) of each are shown below, with the big yellow dot representing the retail location and the pink circle representing a 3-mile radius around the retail location (yellow dot). A data table with information extracted from GIS maps (Census databases were attached to the maps) is presented at the bottom of this page. 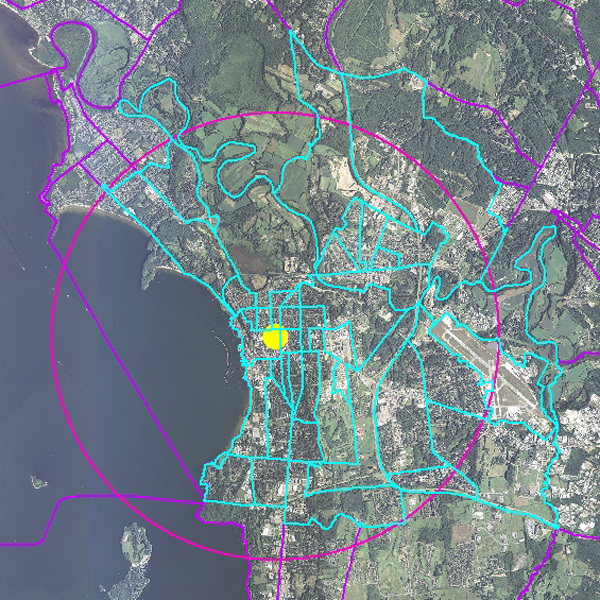 Get Visual can perform this type of analysis for any area in the United States, large or small. Demographic data can be assembled from any collection of geography, including counties, zip codes, tracts, and more. The expected 2-mile radius market area for the proposed Pittsburgh location has a total population of 100,000 people and exhibits very favorable demographic and income characteristics. The educational attainment and median household income of this area is on par with or exceeds such characteristics for market areas served by successful retail locations in the other four cities. In addition, the relatively small Pittsburgh market area has a significantly larger population than the other market areas, due to high population density in Pittsburgh. However, it should be noted that the Madison market area is very similar in many respects. Given the financial success of the retail locations in four other cities, the proposed Pittsburgh location should also perform well based upon the demographic market area characteristics shown.